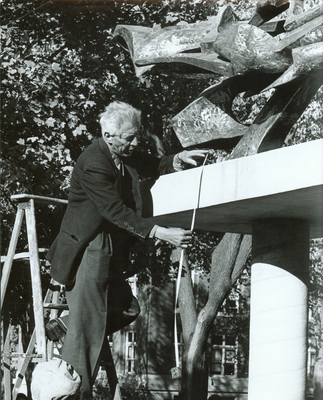 "Ted Egri measuring sculpture October 1965"
An image of the sculpture Impact of Experience on the campus of the University of Northern Iowa in Cedar Falls, Iowa. The sculpture by Ted Egri was installed between Rod Library and the East Gym (now the Innovative Teaching & Technology Center) in 1965. The medium is Cor-Ten steel. "Ted Egri measuring sculpture October 1965" (2019). Art on Campus Photographs. 50.